Former Culture Minister Mikhail Shvydkoi shares his thoughts on the relationship between art and reality and what it is that makes Russian literature so special. The Read Russia project, which has been very successful abroad, will now turn its focus inwards, and I am confident it will benefit everyone – no matter what literary preferences they have. People like to lament that modern Russia is devoid of good literature, but this is about as justified as claiming that we do not play football. Contemporary Russian literature – including what is written in the languages of the various ethnic groups that comprise our country – reflects the level of national self-examination. This idea that any given country is devoid of good literature has been around since time immemorial – I am sure it existed in Pushkin’s day too. I hope that this year will give us an opportunity to have a serious discussion about literature and artistic expression in general, without amateurish assessments and naïve observations about the relation between art and reality. 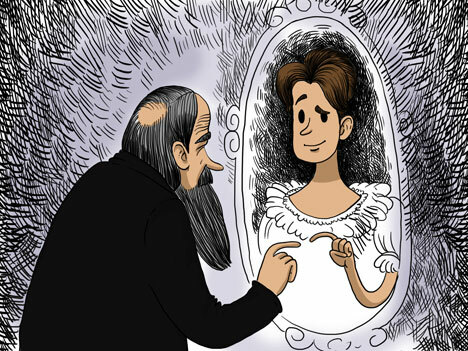 We often quote the epigraph to Gogol’s “The Government Inspector,” which contains the famous Russian idiom “Don’t blame the mirror if your face is crooked.” We usually do this to prove the point that literature can indeed be very true to life, yet a mirror image is by its nature an altered version of reality. Art and literature are a sensual expression of extrasensory existence. That is why the mirror that an author places above “the long road of life” always possesses some magical qualities. There is no point in demanding that a work of art should be utterly true to life. Not even prose that claims to be based on real events. After all, we do not expect musical compositions to be an exact match for the human voice. Alexander von Benckendorff, the head of the Tsarist secret police, famously advised Alexander Pushkin to remember in his writing that “Russia had a glorious past, a beautiful present, and a future that will exceed even the boldest expectations.” There are modern critics who share these views, and by their standard the “fantastical realism” of Gogol, Dostoyevsky and Saltykov-Shchedrin is unacceptable. I disagree: art always distorts reality, even when it creates an elevated and clear image of it. In his novel “War and Peace,” Leo Tolstoy created his own version of the Battle of Borodino, which has been contested by military and civilian historians alike for decades. Yet all that it proves is that a work of art can replace reality in public consciousness, subsume and recreate it into something more authentic and tangible. That is the essence of creativity. Literature seeks a higher truth and a higher meaning to a human life, and therefore has no concern for factual representations. Yury Tynyanov described his approach to historical fiction in the following way: “I start where the documents end.” I would argue that this is exactly what any modern prose writer does too. Reread Vladimir Makanin’s novel “Asam,” the best book about the Chechen war in my opinion, and you will see that I am right. A holy attitude to the word, to the mystery of human life, is ultimately what endows Russian literature with the supreme morality that has been the Russian people’s guiding light on their difficult path through history – a path of suffering, loss and undying hope. I am reminded more and more often of V.V. Rozanov, who wrote that we need a great, beautiful and useful life instead of great literature. But we are Russian, after all, so we want to have both: great literature and a great life. Mikhail Shvydkoi is special presidential envoy for international cultural cooperation. He was Russian culture minister from 2000-2004.